It's been like 2 weeks that Eliza has not needed her pacifier already. It wasn't all too bad and we didn't go cold turkey either. 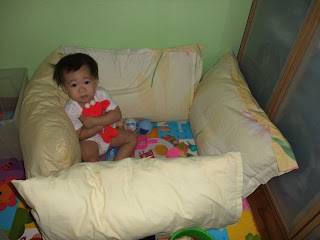 While the last time i blogged about it she didn't need it for bedtime. The day time nap was a bit difficult but by God's grace came one friday when i couldn't remember where her pacifier got hidden and i didn't want to go out of the room to find the other spare ones either. So i told her i couldn't find it and that she's a big girl now so she doesn't need it. There were some resistance initially but it wasn't really drama enough for me to remember what happened after that. So it's bye bye pacifier. I threw them away. yays! She occasionally mentions it these days but i'll say that she's a big girl now and don't need her 'tu tu' which she affectionately calls it. I'll say that mummy/daddy/ah-ma/elmo doesn't eat it either. And she'll say "Elmo mai/mummy mai/ah-ma mai". Last night i heard her say that to herself, repeating the people she knows and saying they don't want (it), i guess. 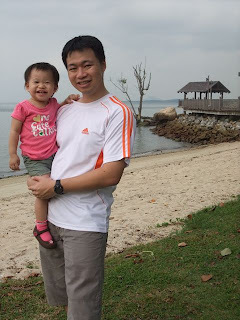 To jump start on some informal formal learning, i started doing "Letter of the Week" with Eliza last week. I've been wanting to do so for a long time, after being inspired by some mums who are doing it..and also to find some activity to engage Eliza in during the day. There are loads and loads of resources available online and it was tough to choose through all of them. ABCand123 is one of them that helped me jump start this whole project. So we started with the Letter A! It was a little messy for me initially because Eliza wanted everything in the basket (see the green and white woven basket on the right?) 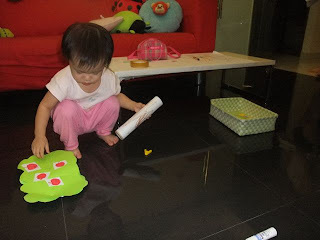 and I didn't have time to explain anything much before she jump started into her activity. Oh well...little excited girl. 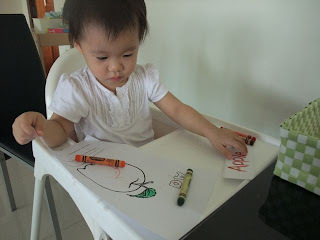 :P Then i found the high chair too constricted to do colouring or other activities. Still we did start with learning & colouring APPLE. Not that she doesn't know it anyway. It took her a while to get the hang of the pasting, even so i needed to do a lot of guiding. After that she 自由发挥 and started pasting it on herself and found it quite amusing. 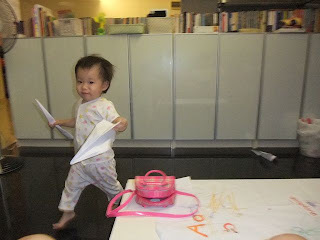 Weekdays are really rushed after i come home from work, still we manage to have fun with paper Aeroplanes! We eventually made the tree though! 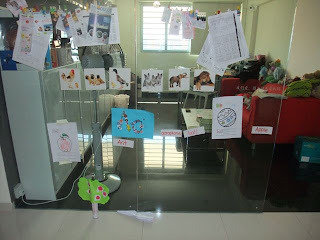 So we learnt the letter A: Apple, Aeroplane, Ant (i wanted to do some make-an-ant activity but just didn't have the time on the weekday). 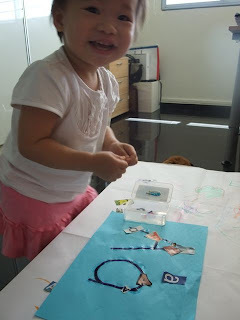 She had fun pasting the words and her works on the glass panels and i'll try to review the words with her when i do. Actually, i did quite have fun preparing the 'lesson' and may expand to include other non-letters activities in future. 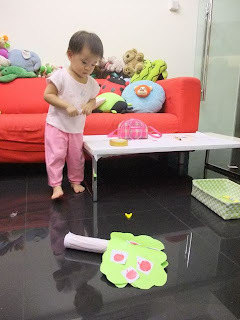 Somehow i also realized that this was more or a platform for her to learn words and do fun stuff cos i realized she does know quite a number of alphabets from baby signing time. Still, there're 26 of them...and we have 1/2 a year more to learn many many things! More on letter B next week! Last sunday, we had my SIL's car for the whole day. It was perfect, considering we had quite a bit of places we had to go. It's a sunday right? And we make it for church on time. It was a bit tough trying to get Eliza to wake up. She was still zzzing at 8am! By the time we got out she was still a little dazed. 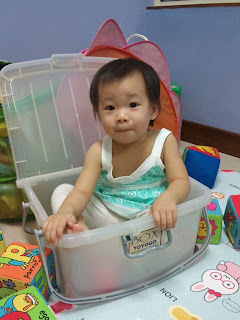 This is her in the playroom during the sermon time. She'll always promptly tell me to go to the playroom after she's bored out in the church sanctuary. This is obviously her favourite place, even though she'll cling on to me if her friends come in. Ok la, she also does attempt to play but she's the non-aggressor type and giving type. So she'll retreat or give away the toys if her friends want her toys. Love it that she's quite helpful in keeping the toys when we need to leave. 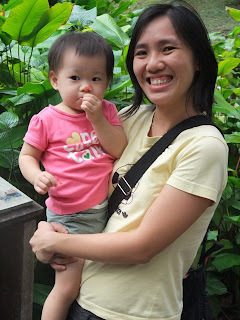 In between we had lunch with my cell at Waraku Pasta at T2 and rushed off to Ww's colleague's son's birthday party. We didn't stay for long though cos by then it was 2pm and Eliza hasn't had her mid-day nap yet. She eventually did fall off to sleep in the car on our way to the next destination. We decided that since we have the car, we should go to some ulu place that's quite inaccessible unless you have a car. Ww said it was a secret place and surprise but i kinda guessed where we were going to go eventually anyway. Doesn't look like SG. I would love to have spaces like this for Eliza to run about (and the weather a bit cooler)...and at least she won't be so afraid of walking on grass. 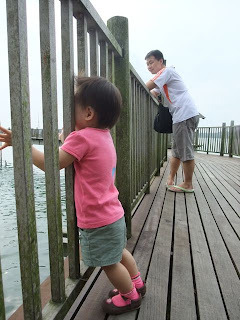 After a few minutes she'll be turning around to me and begging "mummy baobao1". Anyway, this is at the Saddle Club, which i think is near Bukit Timah. There's a cafe there which is quite cozy for some afternoon tea and horse watching. Eliza was taking such a long nap she only woke about 415pm...and we could enjoy our coffee. After Eliza has woke and drunk her milk, we took a walk about and saw horses up close. We saw horses doing their exercises (the trainer makes them run round and round and round this round fenced area), we saw kids riding horses, we also saw the horses grazing at their fenced area. After that we wanted to go Vivo for dinner but Ww took a wrong turn and we landed up at Scotts road. 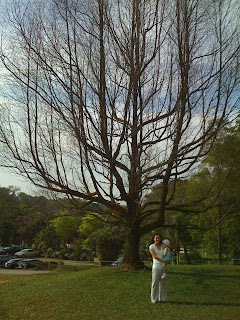 We thought, since we're so near the Botanic gardens, we might as well make our trip there. Anyway, Eliza was hanging around this coin slot machine that dispenses fish food and we bought one for her. We wanted to head off to other places but she was so adamant in opening the fish food pack that we just have to let her clear it in the pond. 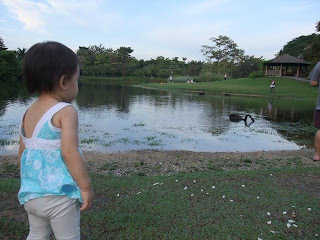 She enjoyed pouring the fish food and watching the fishes eat, though she only could pour it quite near the edge of the pond so a lot of the fishes were crowding there for a bite of the food. 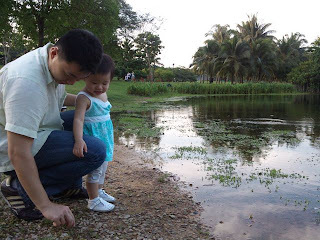 This water-loving girl wanted to step into the pond but we had to pull her back and daddy found a interesting activity to do. Throw pebbles into the pond. Still it was a fun day! We made reservations at the Azur to celebrate daddy's birthday so we went there earlier to explore and let Eliza run about the airport. 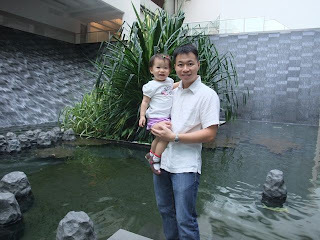 There were nice pockets or gardens at the mrt terminal which Eliza loved cos there's water features. 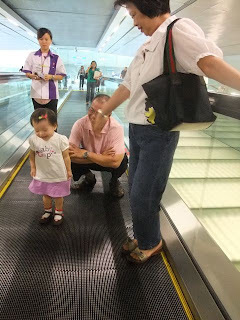 It's quite a distance between the T2 and T3 link to the mrt station and the travellator was quite interesting for Eliza. To walk or not to walk? We knew Eliza will want us to carry her once there's no interesting stuff for her to gravitate her to. 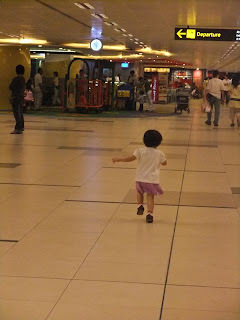 At the exit of the T3 mrt station, i told Eliza that the playground is there and she can make her way there. 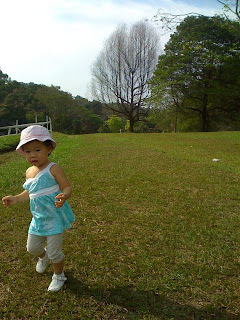 It is quite a distance from the mrt station exit to the playground but i'm not sure if she's familar with the place and i think once she figured out that this place looks familiar or that she saw the playground, off she goes. No turning back, no turning back. There's no use even trying to hide cos she didn't even bother to look for us! They were setting out this nice array of flowers and a swing in a cage which was quite a photo moment for a lof of people getting their kids to sit on the swing in the cage. 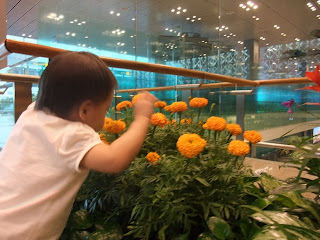 While Eliza was waiting for her turn, she was also smelling the flowers. She picked this up from the baby learns to read flip up books, where we learn the word smell and there's a picture of a girl smelling the flowers. I'm not sure if she smells anything much from the flowers though. Anyway Azur's buffer spread was super fantastic and i loved the hagen das ice-cream which is just too much for me. I didn't have time to take photos cos the food was wow and cos we had to manage Eliza who was also quite overwhelmed by the variety of foods...especially wanting those foods i'm not so willing to let her indulge. 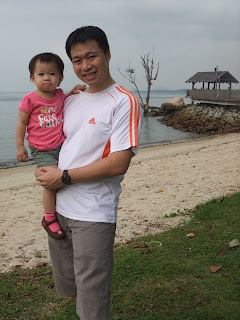 Anyway, we were so full after that daddy, Eliza & me had to take a walk. 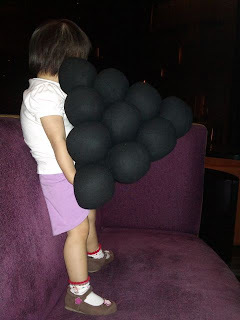 She especially loved playing or more like lifting the upside-down-grape cushion. It's been at least 2 weeks since Eliza has gone without her pacifier at night. She still asks for it but i have been able to deflect her interest to something else more exciting. (gosh thank God for all the ideas at the right time). Some days, like today, was going to brush teeth and standing on the covered toilet bowl while doing so. Other days, it's slathering moisturizing cream on her or hugging her Elmo, or stuff i somehow just can't remember now. At least it worked at that time. I realized that there're nights when she doesn't ask for her pacifier. And i knew she could sleep without it, and without having to fuss about not having it. the other hurdle to overcome was myself because it is easier to get her to sleep or calm down with the pacifier and i was also the one dependent on it. This is especially in the deep of the night when all i need to do sometimes is pop the pacifier to her and she'll just zonk out, just like that. Gosh who doesn't want that! (this doesn't happen when she's having those scratchy nights). When i could overcome the deep of the night pacifier popping i was ready for the no-pacifier nights. One of the nights we were reading her fav bedtime storybooks where the baby was taking eating the pacifier but the baby's older brother wasn't..and i was telling her that she's a big girl now and doesn't need pacifier. She kinda bought the idea that time, so i said Elmo doesn't need one, mummy doesn't etc etc etc. Ok at least it helped for a few nights. Daytime naps are a little difficult cos my mil usually gets her to sleep and she'll be quite ok with giving her the pacifier. 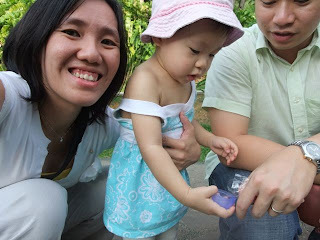 Even one of the nights when we went out and my mil put Eliza to zz, she also gave her the pacifier. Considering, i usually keep the pacifier in places where Eliza can't see but somehow my mil will know. "We find that attendance in preschool centers, even for short periods of time each week, hinders the rate at which young children develop social skills and display the motivation to engage classroom tasks, as reported by their kindergarten teachers” (Loeb et al 2005). We might guess that the problem lies with poor quality preschool centers. But even high income children—-who presumably attend the better preschools—-showed increased behavioral problems if they had attended at least 15 hours a week (Loeb et al 2005). Moreover, the effect is dosage-dependent. The more time children spend in centers, the worse their behavior becomes. Researchers found that the more time kids spent in non-maternal care during the first 4.5 years of life, the more behavioral problems they developed. Consider the findings from the Stanford / University of California study. Kids who received non-parental care outside of childcare centers (for example, those cared for by grandparents or nannies) did NOT suffer increased social problems. According to this study, it wasn’t necessarily being away from parents that made kids misbehave. It was spending many hours in group care with peers (Loeb et al 2005). Other evidence suggests that spending time at preschool-—or daycare-—is downright stressful. For instance, it’s not about being separated from parents. Kids who receive home-based care do not have elevated cortisol levels, even when their parents are absent (Dettling et al 2000). Nor is it about differences in daytime resting. Kids in group-based childcare show more stress even after taking into account any possible differences in napping or resting opportunities during the day (Watamura et al 2002). Many researchers suspect the culprit is social stress—-in particular, dealing with peers. Megan Gunnar, a University of Minnesota psychobiologist who has studied cortisol levels in preschoolers since the 1990s, agrees. “There is something about managing a complex peer setting for an extended time that triggers stress in young children” Gunnar (ResearchWorks 2005). In fact, part of this reasoning is sound. You do need people to learn people skills. The question is--which people? Preschoolers need to learn empathy, compassion, patience, emotional self-control, social etiquette, patience, and an upbeat, constructive attitude for dealing with social problems. These lessons can’t be learned through peer contact alone. Preschools are populated with impulsive, socially incompetent little people who are prone to sudden fits of rage or despair. These little guys have difficulty controlling their emotions, and they are ignorant of the social niceties. They have poor insight into the minds and emotions of others (Gopnik et al 1999). Moreover, it’s hard to see what’s natural about herding together a bunch of children who are all the same age. From the evolutionary, historical, and cross-cultural perspectives, it’s an unusual practice." This was what Ww was saying from the beginning about the advantages of homeschooling. Kids need to learn from adults more than to learn from peers. I guess, it's just not going to school/daycare too early? I do sense Eliza watching other kids and what they do...sometimes i wonder if she'll learn from them good/bad or be able to filter out the right stuffs (unlikely huh?). I know personality will play a part, and Eliza being the generous, sharing & non-confrontational toddler, she's gonna be super stuck to me when there's another toddler she's feels threatened with. I've been lagging behind on my posts lately cos there were so much to do after eliza's bedtime. (ok some of it is online shopping...) but some projects and even work, else it's chatting /watching tv with ww. 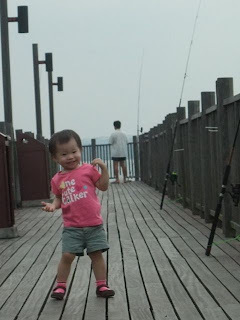 So i may have missed out quite a number of photos in between that by now i'm too lazy to post le..but this was what happened this weekend while my mil was away at genting. I'm quite unpracticed with cooking while eliza's around and by experience, for the past months or so she has always been asking to be carried while my mil or i am cooking (in the few times i do cook). she'll come between our legs and the cabinet, whining and wanting us to give her the attention. So far, food & tv is the best distraction, i try to keep it as the last resort. and even so it doesn't always work. 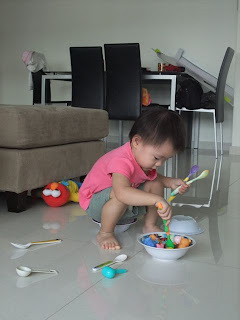 The mornings are best for cooking, esp preparing her meals, when she's in the best of mood and will play by herself. Eliza cooks her fishes and bears. And she'll feed it to us...or her good friend Elmo. I've since upgraded her cooking ingredients to uncooked rice. 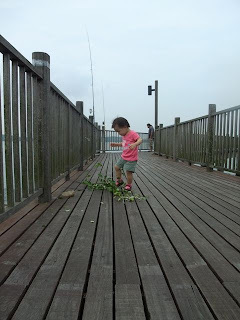 children's day was quite a cloudy day and we hopped on the opportunity to go to the Changi Boardwalk since we didn't make it there the last time we planned to. Eliza smelling the Ixora. The fad of the month is picking ixora flowers and plucking its petals. Obviously, the sea part is the fun part. Enjoying the sea breeze. silly cute girl dancing in joy. She was really happy to be out there. We told her to leave that bunch of leaves alone and we walked on ahead of her, only to hear her whines and found her caught in the branches. That bunch of leaves was actually a rose branch and had loads of thorns. Her socks got caught in the thorns and she couldn't get out of the tangle. It doesn't help that she couldn't stay still in her struggle to get away and got more tangled in it. Anyway, with Ww's help, we managed to get the branch out and threw it into the sea, lest another unsuspecting soul gets caught in it. What a lesson for Eliza! Listen & obey mummy & daddy ok? As usual, busy plucking the weeds and slotting it through the timber gaps. Back at home on friday. Playing in her play room. Now playing hide-and-seek with Elmo. 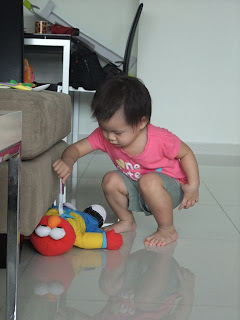 She'll hide Elmo and then ask me 'where? ', and then both of will find Elmo and burst into giggles when we find him. 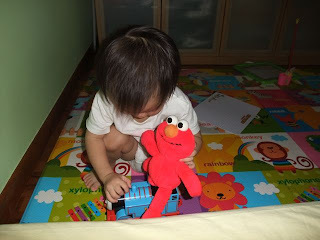 Eliza gets Elmo to sit on Thomas the train, she sits on it too later. 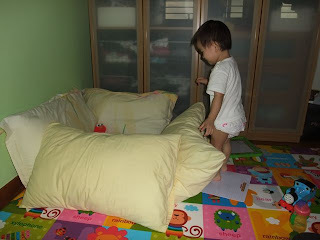 Building a 'house', with some mummy's help. And then she puts elmo in it. Later adds on all the balls, toys and whatever she can find. My little girl is growing up so fast. This week, she's spurting out more words. And i love the way she says 'Hello Kitty'. She mixes some chinese in what she says like 'mummy 坐', or she'll count 7,8,9, in chinese, 猪猪. Sometimes she says some words that surprise me, eng & chinese, even though there're many words not fully pronounced and it takes me a while to figure out what she's saying. 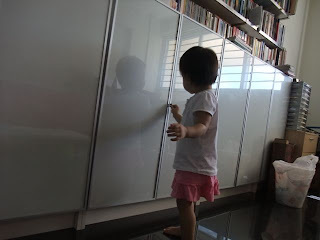 She can be quite drama-mama sometimes and will exaggerate her displeasure by pretending to cry terribly, but i'll give her the blank look and request that she tell me what she wants instead of behaving like that. The immediate response she tries to wring out of us is sympathy but then mummy&daddy are smarter, we know when it's for real and when it's not. 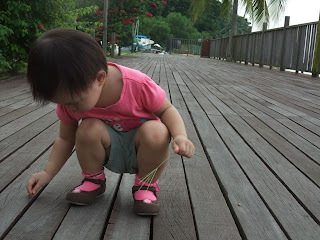 One of the things that i don't always like is that she'll not walk for long when we go out, and will very quickly turn 180degrees to request 'mummy bao4bao4'. maybe we should bring the stroller out more often ya?